Take Action!| Save the Internet……. Now is the time for net neutrality. During the campaign, you pledged to “take a backseat to no one in my commitment to Net Neutrality” and to “protect the Internet’s traditional openness to innovation and creativity and ensure that it remains a platform for free speech and innovation that will benefit consumers and our democracy.” You also committed to appointing leaders at the Federal Communications Commission who support Net Neutrality. We congratulate you for putting this crucial media and technology issue in the public spotlight, and as the first priority in your technology agenda at www.change.gov. 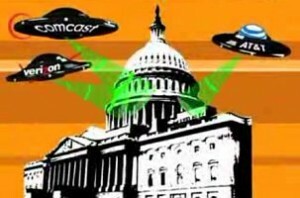 We urge you to make Net Neutrality a top priority and work with the new Congress and FCC. Net Neutrality is the cornerstone to protecting innovation, free speech and democracy on the Internet. Your support right now is essential. Click on the link below to remind Mr. Obama that we expect him to keep his promise to preserve an open and fee internet for all. Previous Previous post: The Division Between Science and Religion is Not Clean-Cut | Think Progress……. Next Next post: George W. Bush’s Nightmare Before Christmas | Santa Bush…….